Only if your heating system is installed well, will it provide optimal comfort, efficiency and safety. A system that is improperly installed can cut down its own efficiency by almost half. Important considerations for all your Westfield heating installations are discussed below. Always hire a reliable and well-known heating contractor or plumber to survey your house and provide an estimate before a heating installation. A good contractor will be able to calculate the heat-loss and wind flow, so you can then plan your heating system accordingly. A good contractor will also give you a written proposal that outlines the necessary work and costs. Some contractors even offer to do these services. Size your heating system as one that is too big will end up being wasteful, while heating systems that are too small will be unable to provide sufficient comfort. Again, a contractor can help tell you what size heater you need. Heating pumps are very efficient methods of heating as compared to electric resistant heating like baseboard heaters and furnaces. Geothermal heat pumps are also known as ground source heat pumps and are extremely advantageous as they cut down your energy consumption by 30 to 60 percent. These pumps are also reliable, sturdy and can fit into a large variety of homes. Installing a programmable thermostat is ideal, especially one with multistage functions. This way you can program your heating system depending on temperature variations. 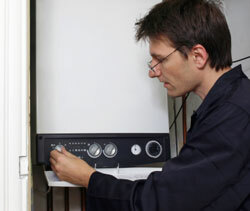 But always remember to get the help of an expert before your Westfield heating installation. If your home is located in a place with moderate climate, energy saving heating systems are ideal. So call American Specialty Co. now to schedule our local heating system technician in your home today! Serving: Clark, Westfield, Summit, Scotch Plains, Bedminster, Far Hills, Bernardsville, Basking Ridge, Livingston…and all of central NJ.